For anyone who knows me, this isn’t a rare thing. My body turns against me with frightening regularity that usually means I tend to feel sick every so often (it’s a gas thing, and by that I’m not using a colloquialism for it being funny). …okay, let me line up the shot from a different angle. Whenever I tell people I read and write comics, there’s often one of several responses I get. More often than not, I get a raised eyebrow of slightly concerned curiosity. A nearly-30 year old man, reading comics and writing/about them. Hmm. Even if the other person has briefly read comics in the past, there’s an element of scepticism that’s difficult to ignore. Mainly because it’s slapping you in the face with its obviousness. This is usually followed by questions over what I read and sometimes, how much I typically spend a month, at which when I divulge my ‘addiction’s monetary costs, the sense of concerned curiosity gets a sprinkling of outrage and scoffed ridicule. So if what I’m going to tell you seems weird, well… I expect it. But allow me a moment to explain. 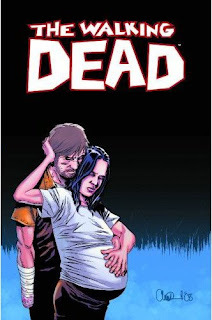 It was the most recent edition of The Walking Dead – a comic – that has made me feel sick. Hardly the most glowing way to recommend the medium to you, I’m sure. But I refer to the above caveat about moments and letting me use them to explain as to why this is. The Walking Dead is a series about the world overrun by zombies. The premise, on its surface, is a typical one – unknown plague/virus/McDonalds has changed people into raving flesh eating mutants and humanity is left to struggle with this by becoming surviors, and as a result we discover that it’s Not the Zombies Who are the Real Monsters, but Humanity Itself. You know, standard horror fiction theme. The Walking Dead goes beyond that. Way beyond. Most zombie movies will take you on a journey which emphasises this theme through the changeable brutality of human nature. How people react under immense pressure, devolving to Cro-Magnon ferocity and savagery, turning on each other just to try and survive, something which is mirrored ironically by the zombies, who are, for all their brain chomping nastiness, an expression of human hunger and desire without moral conscience, and thus creatures of purity, untainted by the horrors that we expose ourselves to in trying to find food, keep our loved ones safe and live at the expense of everything else. However, these films are finite. The longest zombie movie lasts around 2 hours. There’s yet to be a long running TV series about zombies (as far as I know). The Walking Dead has no limitations. Yes, it’ll eventually come to an end, but its current verve and medium allows it to go further than any other work out there as a piece of zombie-driven horror fiction. To be frank, it’s horrible. Writer Robert Kirkman has created a universe where no one is safe. Where main characters get maimed, mutilated and killed in the most terrible of ways. Where even the most unspeakable of horrors is carried out on page. It’s terrifying. It’s shocking. At times, nauseating. 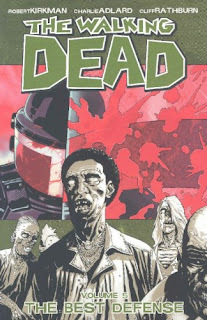 This uncompromising zombie tale is meticulously written and drawn (artists Tony Moore and Charlie Adlard do a stupendous job) with a very easy to follow narrative that envelops you into a world of hope and grime and chokes you on its depravities. It is totally captivating. It feels real. Characters are introduced and fleshed out, each with their relatable traits, and just when you start to get comfortable with them, the sledgehammer of their reality hits and things take a terrible turn. And it’s all within the realm of realism – you could easily see people acting the way they do reflected here because, well, it happens in our world. Just under different circumstances. The events that occur in The Walking Dead, in particular the most recent trade volume, (Volume 8 “Made to Suffer”) affected me more than any other piece of fiction has in a long time. I’m not going to spoil it, as that would miss the point and me describing them to you wouldn’t have the power as they would you experiencing them, but for the first in a long time, I had to stop reading half way through because it was just all too much. Too intense. Too painful. Here was a book, in a medium which sometimes has me deemed as a some deviant man-child, that had actually left me shaken to the core at what was happening to its characters. And by the end of it, my throat had tightened and stomach felt like it had been repeatedly pounded by a giant sledgehammer. The sense of relief in finishing that chapter soon became replaced by an urge to find out what happens next, as with all good fiction, but also knowing that this powerful effect The Walking Dead had – not for the first time – was something that will likely stay with me for a long, long time. To have that same effect, The Walking Dead couldn’t be done in any other form. Film is limited by time and space, and while TV avoids such problems, there’s no TV broadcast company that would be brave enough to allow the sort of stuff that happens in The Walking Dead. It’s too raw and untamed, not to mention the fact there are things depicted here that would be difficult to reproduce on a TV budget to the same level of effectiveness. In a similar vein, a book would lack the dual layer of simultaneous narrative comics are unique with, showing you a picture that freezes a moment while the words lace them with separate, yet combined meaning, playing with time. A comic panel is designed to be looked over as long as the reader allows, without that break in narrative becoming unnatural, meaning the horror of certain things becomes prolonged and fixated, while your imagination moves them in a very personal way between panels. It’s a depth easily taken for granted. As said by people much smarter than me, comics are the last 'underground/guerrilla' medium out there. They can express anything they want with limited budget and limitless imagination, sometimes with just a team of one person pulling the strings and creating something that visually pushes narrative boundaries without fear of executive decisions and a million other financial fingers getting in the way as often does with TV and film. Again, this is something easily taken for granted. 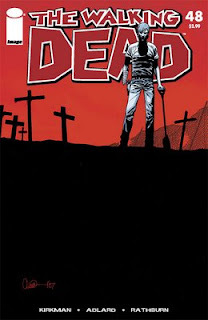 Comics are generally more accepted than they’ve ever been, but having something that can affect you on that level, the way The Walking Dead affected me and countless others (read the reaction to the series online and you’ll find a plethora of critical acclaim), will probably come as a surprise to those who still think it’s a puerile medium. 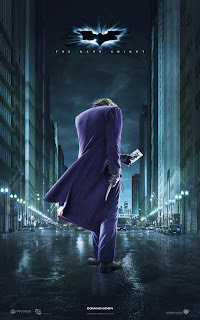 It’s an attitude that will be sternly tested in mainstream eyes through the cinema screening of The Dark Knight as well, which is being heralded by some quarters as a crime film epic that just so happens to have Batman in it. People are generally walking away from this movie, shaken, disturbed and full of praise for its powerful and intense story. Quite an achievement given its protagonist is a man who dressed up in a rubber bat-suit. Comics can move you like any other medium – it’s just finding the right story that pushes you. And there’s plenty out there if you’re willing to look for it. From the political, journalism sci-fi edge of Transmetropolitan, to the fantasy and multi-cultural epic of Sandman. From the socipolitical gender commentary of Y: The Last Man, to the hardboiled crime thriller of Criminal. From the revolutionary historical samurai saga of Lone Wolf and Cub, to the equally influential and all encompassing Watchmen. Heck, even if you like to see where you favourite fairy tale and nursery rhyme characters ended up, there’s the fantastic Fables to try out. And if you’re after the best horror movie that will never be made, something that will genuinely shock you, you could do far worse than The Walking Dead - just don’t blame me if it truly and quite literally moves you. But then, isn’t that what we all want our fiction to do? Heh, cheers – been reading yours (had to laugh when you mentioned Seb did a runner, I could just imagine his expression) and meaning to make another entry soon with preview material of a project of mine but never got around to it… delays delays ;-) But I should be back with something soon enough.